As most of you know, my husband went out of town on business. How do you know this? Well… I wrote a pretty awkward post about it. Remember my last post where I drew you a Capybara Ballarina and there were talks of me eating entire boxes of gluten-free mac and cheese? Yeah. #SingleLadyProblems. Well, things didn’t get any more normal in the evenings to follow. I baked and consumed an entire dozen chocolate chip cookies. I spent Saturday evening making jelly and sobbing while watching the movie Stepmom. Don’t worry… I totally saw a bunch of friends and went out into the world, but when it got late and my hands needed to keep busy, I would get in the kitchen or get out a paintbrush or turn on Netflix and watch four solid hours of birthing documentaries. Whoa. Real story. I saw everything. I then spent an hour and a half researching midwives and doulas and water births. And no I’m not pregnant, I just have access to Google, which lends itself to my crazy inquisitive spirit. Thanks, Google. I also did some sensible things! I took the dog for walks. I cleaned weird corners of the house. I brunched. I kale-ed. This salad happened. You know how I feel about kale. I probably need not remind you… but if you need some KALESPIRATION (that’s totally kale + inspiration) I can hook you up. How about this Dip? Maybe this Kale Salad With Creamy Almond Dressing? You can always shove it into a green juice or a smoothie! See? I really like this stuff. Feeling inspired? Good. This salad is what my husband would call “the ol’ fruit, cheese, nut combo”. He is what I call “the ol’ sweet-tooth monster”. As you might be able to surmise, the ol’ sweet-tooth monster is really a fan of the ol’ fruit, cheese and nut combo. Also, to put things in perspective, my husband came back from his business trip with sixteen candy bars in his suitcase. SIXTEEN Coffee Crisp bars sandwiched between pairs of dirty jeans and worn button downs. I was impressed. My description is starting to sound like this salad tastes like sixteen candy bars. Nope. Not the case. This is the salad that you trick your candy bar-hoarding, sweet-tooth monster husband into eating. He will be too distracted by sweet golden raisins and bits of savory cheese that he will guzzle it down before realizing that he just consumed a whole head of kale. Yer welcome. Wash and prep your kale, removing stems and cutting the leaves into manageable pieces. 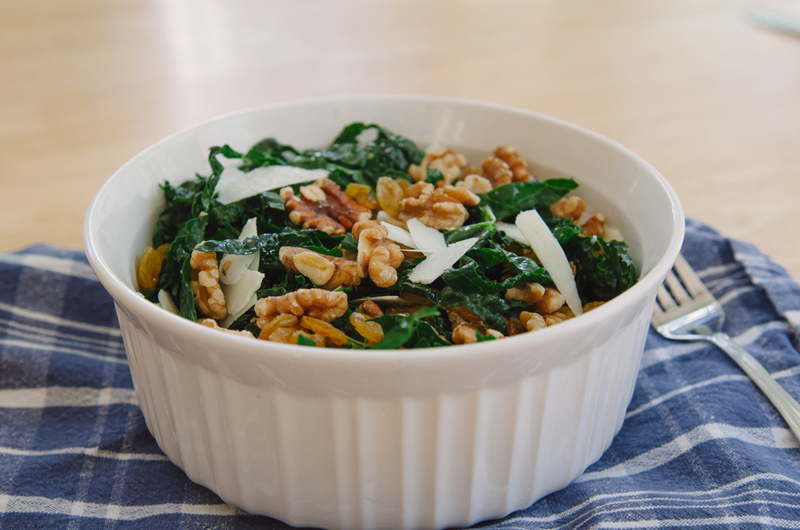 Put your chopped up kale into a good sized salad bowl and set aside. 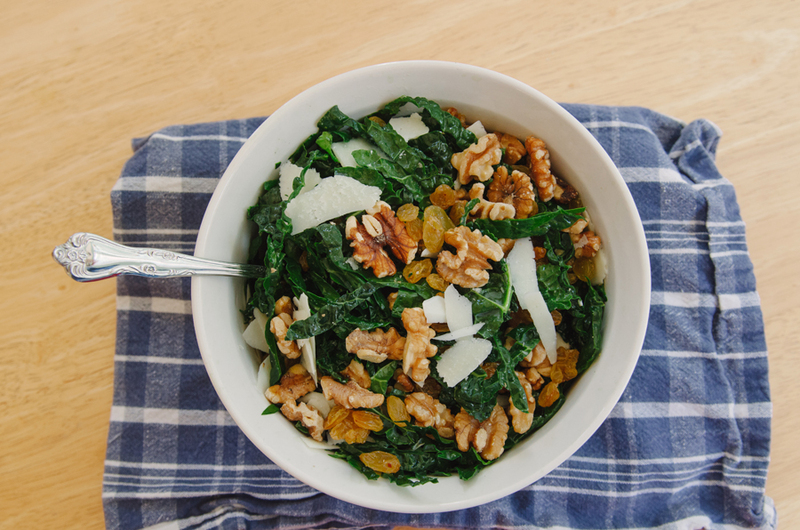 Add your raisins, toasted walnuts and shaved bits of pecorino cheese. Combine all of your dressing ingredients in another small bowl and whisk until combined well. Dress your salad and toss using your hands. Massage the dressing into the leaves of the kale and allow it to sit for a few minutes in order to soften the leaves. OMG you crack me up and I wish we lived closer because Todd travels all the time too and I tend to get myself into trouble Googling all the weird crap that pops in my head too.